Source: Quakenbush Monument, Scotland County Courthouse, Laurinburg. The Quakenbush Monument honors William Graham Quakenbush. The granite monument stands 22 feet tall. The upper portion is an obelisk resting on a three step base and a two block plinth with inscriptions on all four sides. The word "Quakenbush" in large bold letters adorns the front of one of the base blocks. The base at it largest dimension is 6 feet by 6 feet square. Front: WILLIAM GRAHAM QUAKENBUSH, / ORANGE COUNTY, NORTH CAROLINA. / DECEMBER 12, 1949, / MARCH 9 1903, / LAURINBURG, NORTH CAROLINA. Rear: CHRISTIAN, / SCHOLAR, / PHILANTHROPIST, / TWENTY ONE YEARS / PRINCIPLE LAURINBURG SCHOOL, / 1870 – 1900. Right side: IN RECOGNITION OF HIS / EXALTED CHARACTER, / IN APPRECIATION OF HIS / ENNABLING INFLUENCE UPON YOUTH. / ERECTED BY A PEOPLE / GRATEFUL FOR HIS LOVE AND SERVICE. Dedication day was marked by two solemn gatherings at the courthouse. In the morning was a memorial sermon given by the Rev. M.L. Kesler of Morganton a close friend of Professor Quakenbush. The afternoon gathering was highlighted by ex-Governor Charles B. Aycock as keynote speaker. Aycock said that he thought raising the Quakenbush monument “the most important and significant event of a generation,” because “men made money so that they may buy monument, other men strove for political success so that their high place might demand that they be remembered… yet…they were forgotten.” Aycock explained that Quakenbush was simply a man that lived for others. At the conclusion of Aycock’s speech at half past three the monument was unveiled by Miss Marnie Bizzell. William Graham Quakenbush was principal of Laurinburg High School from 1879 to 1900, locally known as "The Quakenbush School." In addition to being a beloved educator Quakenbush was also one of the leaders in the movement to form Scotland County. The monument stands at the corner of Roper and Biggs Streets, to the left of the Scotland County Courthouse that is located at 212 Biggs Street, Laurinburg, NC. When facing the courthouse the Veterans Memorial is to the right of the Confederate Soldiers Monument with the Quakenbush Monument to the left of the Confederate Monument. The monument sits in a grassy triangular median between the street and the courthouse parking lot. When dedicated the Quakenbush Monument stood directly in front of the 1901 Courthouse located on Main Street and was surrounded by a wrought iron fence. It apparently became a traffic hazard and was moved onto the courthouse grounds. 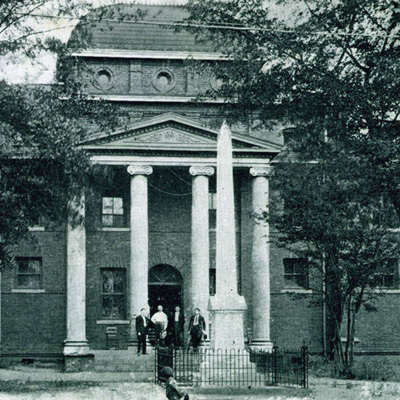 The Quakenbush and Confederate Monuments were relocated to the contemporary county courthouse after its completion in 1964.